Special Offer! 10% off EVERYTHING in our online shop for a limited time. Welcome to Lewtress Health - the leading producer and worldwide supplier of potent herbal remedies. Our Lewtress brand products are unique and more effective than mass market products you find elsewhere. Why is this? On a more scientific note, unique to Lewtress is our range of hand made Bio Active herbal liquid extracts, all based on pressed Kombucha culture for the ultimate in bio availability and absorption. The various closely guarded processes are key to making the herbs more effective and providing a fast reactive time for optimum results. Lewtress is the only company in the world that employs such unique production methods to make the herbs so effective. Don’t forget – FREE Worldwide shipping on all orders! Back in 1994, Rob & Cass Lewis formulated their first Bancha Kombucha drink with the help of a food technology scientist and formed the company known today as Lewtress. Their Complimentary health clinic was where it all started. Clients were treated with Aromatherapy, Reflexology and Herbalism with Iridology. These treatments all needed the re-enforcement of powerful and fast acting natural remedies. Unable to source the sort of products that they required was the problem. There was very little on the market that was of a suitable strength or quality to meet their high standards. What their clients demanded was a natural remedy that was both fast acting and effective. Over the next few years, Lewtress, with their client’s wellbeing in mind, sourced the finest ingredients from around the world to make their herbal remedies, elixirs, superfoods and liquid aphrodisiacs. There were always willing participants, from pharmacists to physicians, who readily undertook in-house trials and provide the sort of essential feedback that they needed. This led to them employing the highest standards in development principles required to make these products so effective. All the results from these trials enabled them to match the treatments required to fulfil their client’s needs. In 2005 Lewtress focused on producing a range of high potency powdered extracts. 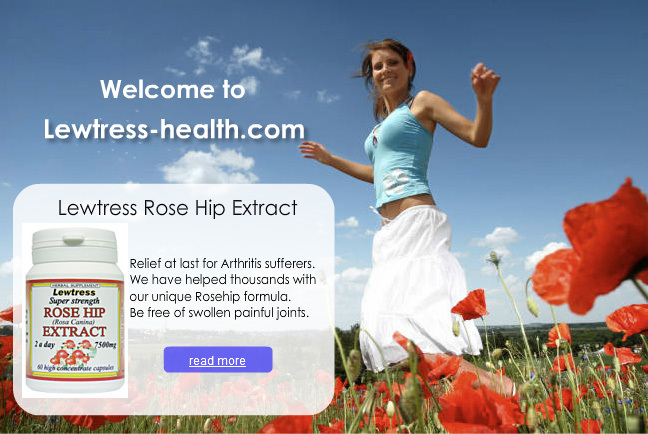 Rose Hip was the new buzz word for arthritis, research had shown that Rose Hip extract had fast become the most effective treatment for osteo arthritis. True to their form, Lewtress came up with the strongest and most powerful Rose Hip extract available. For many years the beautifully named Horny Goat Weed extract with its natural anti-inflammatory and aphrodisiac properties, had been one of their best selling liquid extracts. This led to the production of this wonderful herb in capsule form and again, the most powerful available. One of the most important things to remember is that Lewtress can achieve all this at very competitive prices and in many cases a Lewtress product will work out cheaper due to the high strength and minimal dosage. Lewtress aims to provide only the highest quality products, so you know what you buy has the purity and efficacy to work in our fast paced world. Lewtress still remains a family company and continues to formulate new products to enhance their range. From us to you, wherever you are in the world, the best in health and happiness.